When designing gardens in a confined space, the use of proportions becomes a critical element. In a small garden where you can see everything at once, the design benefits from a refined use of shapes and color. The repetition of shape helps bring the design to life. 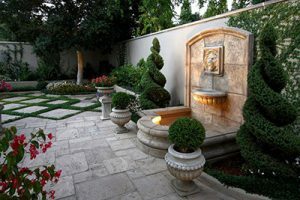 Critical questions to ask when planning and designing a small garden are whether it fits with the overall theme of the house and the personalities of the home dwellers. Do the plants stick with the color schemes of the house, do the shapes coordinate with other objects in the garden. This allows careful consideration of hardscape and other elements like intimate patio alfresco dining areas and small plunge pools. Thinking big when it comes to small spaces is what we do at IVY STUDIO, a design and build consulting firm based in Massachusetts where we create and build intimate outdoor spaces. Contact us at 978 591-0300 or vern@ivystudioMA.com to learn how we may create your small outdoor oasis.